Canners, prep your gear: The Ball brand is hosting its sixth annual Can-It-Forward Day on July 22. As a bonus for Twice as Tasty readers, it is letting me give away a new book to help get you started in home canning or give you new ideas for favorite produce. I love this event. I’m a pay-it-forward person: I would rather go through life knowing the things I do for or give to others are encouraging them to pass it on than build lists of people who owe me. Much of what I give comes from my kitchen. By canning food, I have a stash of salsas, preserves, and other goodies to give as gifts at Christmas, birthdays, or weddings; to share at potlucks, picnics, and parties; and to turn into delicious meals and snacks when people gather at my table. With this blog, I can it forward by sharing what I’ve learned so that you too can preserve, enjoy, and share. As a food preserver’s way of paying it forward, the Ball brand is encouraging you to can it forward. On Friday, July 22, a host of videos that demo a variety of canning recipes will appear on the Ball Canning Facebook page via Facebook Live. Some of its chefs and other canning bloggers will show you steps, tips, and tricks you’ve been reading about here. They’ve chosen some small, food-based charities from around the country, which will receive donations as you like, share, or comment on the videos. Head now to the pledge page. You can read more about the event there, and by pledging to can it forward, you receive an online coupon for canning supplies. Watch canning demos on the Ball Canning Facebook page on Friday from 10 a.m. to 3:30 p.m. EDT. Like, share, or comment on the videos to boost the charity donations, and keep your eye out for giveaways to viewers. Ask canning experts your preserving questions via Twitter (#canitforward) from 10 a.m. to 5 p.m. EDT. Share your own canning creations using the #canitforward hashtag on Pinterest and Instagram. I’ll be participating in Can-It-Forward Day by firing up my canning kettle this weekend so that I can share a new recipe with you Friday from The All New Ball Book of Canning and Preserving, which the Ball brand kindly provided. It arrived last night, and my first perusal has me excited about the direction the writers have taken with this volume—lots of bold new flavors and Twice as Tasty-style techniques. Better yet, they’ve offered up a copy for you, along with a coupon for supplies to get you started. Join: If you haven’t done so already, become part of the Twice as Tasty community by subscribing to the blog, liking the Facebook page, and/or joining the companion Facebook group. Think: How will you can it forward? Will you make a recipe as a gift for a friend, a family member, a child’s teacher? Will you share what you make at a dinner, a picnic, a family reunion? Will you do the work with someone new to canning, like a friend, a sibling, or a child? If you are new to canning, will you can with someone who will get joy from teaching you, like a parent or grandparent? Take one of these ideas or come up with your own. Comment: Tell us how you plan to can it forward, sharing the details of your idea in a comment at the bottom of this post or on the Facebook page or group. Submit your comment between now and noon MDT on July 21. Visit: Return to Twice as Tasty on July 22 to see the chosen winner. I’ll also be posting the recipe I chose to make from the new Ball book—of course making it Twice as Tasty. Whether you win or not, do return to the blog post or Facebook group when you’ve completed your can-it-forward plan and let us all know how it went. We love a good story. Here’s the not-so-fine print: Deadline for giveaway submissions is July 21, 12 p.m. MDT. Winner will be announced July 22, 8 a.m. MDT, on Twice as Tasty. Winner must have a U.S. shipping address; international readers are welcome to participate, but you’ll need someone with a U.S. address to send on your prize or hold it for you until your next visit. 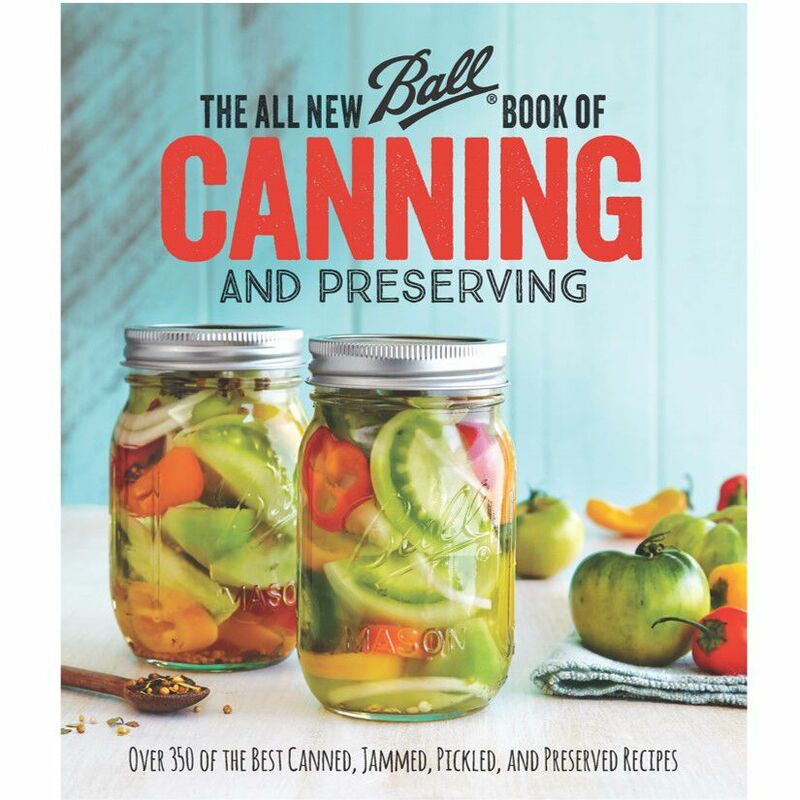 The winner will receive a copy of The All New Ball Book of Canning and Preserving and coupon from the Ball brand. By participating in this giveaway, you agree to share your name and U.S. shipping address with me and the Ball brand, which will be sending you the prize. You also allow me to feature your comment on Twice as Tasty. Thanks for reading, participating, and canning it forward! Leave your comment that enters you in the giveaway below. UPDATE: Contest has ended. Meet the giveaway winner here. I am so into canning now. I make a jam that is Blackberries (say 6 pints)/Lemon Juice & Zests/Turbinado Sugar/One entire Vanilla Bean Pod + Pectin; that is fantastic actually. I scrape out the vanilla seeds but also put the pods in with the fruit while I cook it (then fish them back out!). People freak over this. Is it canning-it-forward if I give half of this to my brother? Family sharing is absolutely canning it forward. We made a similar jam with apricots and vanilla beans last year but left long slivers of pod, as well as the seeds, in each jar. The dark slash through the jar got people asking about the recipe, and the flavor was fabulous. Oh Julie, That sounds divine! (I’m stealing your idea!) Did you use Cane Sugar? You should absolutely steal the idea–especially since it wasn’t mine. 🙂 I was following Liana Krissoff’s recipe from “Canning for a New Generation.” The recipe is here (although I highly recommend buying her book; everything I’ve made from it has been fabulous): http://books.google.com/books?id=6Mk8NxKxftIC&pg=PT153&dq=apricot+and+vanilla-bean+preserves&hl=en&sa=X&ved=0ahUKEwiJvpGF3I3OAhUB9WMKHS03DWUQ6AEIJzAA#v=onepage&q=apricot%20and%20vanilla-bean%20preserves&f=false. It was my first time making it, so I followed her recipe exactly and used white granulated pure cane sugar. I’d probably do it again that way; honey or raw sugar might overpower the vanilla. She called for a rose or white wine, so I used a rather sweet one (gewurztraminer, I think), but for my taste I’ll probably go with a drier white next time. My Grandma taught me to can. When I am canning, I use a lot of the items she had. As I am canning, I remember the times we had together in her kitchen. It is such a great way to remember her. When my Grandma could no longer can, my Mom and I started canning and had great times canning together. My mom is no longer canning due to health issues. We still enjoy “Canning Talk” and it brings me so much joy to gift my Mom and Dad fruit and vegetables, jams and salsas I have canned using the “fruits” of my labor from my garden. I also share my canned goods with the rest of my family and friends. This year, I will be teaching my niece how to can. I am excited to pass this wonderful and fulfilling skill on to the next generation. Great giveaway!! I want to can this year not only for my family, but also to give away gifts to those that help our family. In a culture of so much “stuff,” I love the idea of giving away something I’ve grown, then canned, in my very kitchen. To be that’s like giving away a bit of love 🙂 Happy canning!